Austin Mini sub frames were bolted to the Mini Marcos moncoque making it a simple build. Not the prettiest car in the world and diminuitive in size it still has a strong following today - to such an extent that it has been resurrected and is being reproduced again. 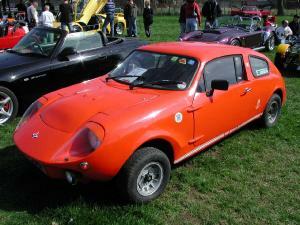 The Mini Marcos spanned the Mark 1 to Mark 4, the Mark 4 being introduced by new owners after Marcos went bust in 1971. The Mark 4 was slightly bigger and rear seats were introduced along with other refinements such as winding windows.